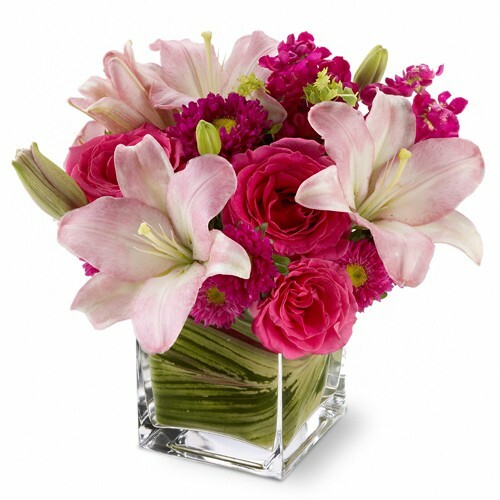 Show Flawless taste when you send this stylish gift of pink Roses, pale pink Lilies, Matsumoto Asters and mixed blossoms arranged in a modern glass cube vase and lined with variegated Ti leaves.. pretty and perfectly high-class if you ask us! Note: Vase shapes may slightly vary depending on availability. Quantities 4 pink roses, with 6 pale pink lilies, and mixed blossoms and Matsumoto Asters, A Glass Vase lined with Variegated Ti leaves. Special Conditions The vase may vary depending on availability.